While we are more and more familiar with popular ideas of enlightenment and spiritual awakening, life still comes at us full force, and hope can turn to frustration as the gulf between our spiritual belief and our everyday life seems to loom ever larger. Through spirited Q&A sessions with Zen master Jun Po Denis Kelly Roshi, The Heart of Zen takes a gradual, step-by-step approach to what has become a vexing problem in spiritual circles. What is missing is integration. If awakening truly transforms every part of the life of a person, where are we getting stuck? How can negative emotions like anger, shame, envy, and jealousy continue to arise? How do our relative egos relate to the Zen teaching of Emptiness, and what does this mean for our intimate relationships, our emotional bodies, our views of the world and its problems? The Heart of Zen represents the next generation of spiritual books because it addresses awakening and spiritual life within the context of creating lasting change through the integration of spiritual insight into the flow and flux of everyday life. Jun Po Denis Kelly Roshi explains how well trained meditation students may learn to be nonreactive to emotions, but they seldom learn how to transform their negative emotions (and the ego that holds them) as part of a more deeply integrated, lived spirituality. This book describes precisely what this means in great detail and with exercises for the reader to follow. 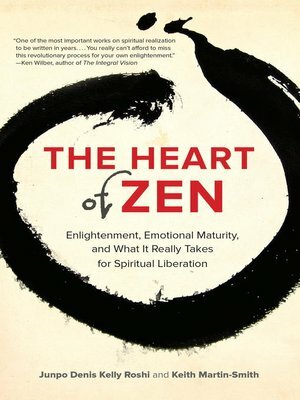 Part discussion on these intricate topics and part experiential guide, The Heart of Zen offers a one-of-a-kind take on enlightenment, emotional maturity, and the integration required to take one's seat in true liberation.